Good afternoon, travelers and voyagers, adventurers and expeditionists, gypsies and globetrotters, wanderers and wayfarers. We come together to cheer for Lauren as she continues her journey along the Camino de Santiago de Compestela. Before beginning her hike today, Lauren uploaded photos for us to enjoy. I’ll include them all in a follow-on post, where I can provide what notes I am able with each image. With the medieval castle of San Esteban de Deyo crowning the hill above her, Lauren sat out from Villamayor de Monjardin for her longest hike yet. Her goal for the day was the distant town of Viana, some 32km (20 miles) distant. Along with her new friends, a woman from Maui and a woman from England, Lauren passed through the tiny villages of Urbiola and Luquín, featuring 13th century towers, Baroque retablo doorways, and impressive, oversized coats of arms. They passed through the town of Los Arcos on the Odrón River which has been inhabited since Roman tomes and was then known as Curnonium. Beyond Los Arcos was the hamlet of Sansol and the village of Torres del Río. I’m sure Lauren must have looked long and hard at the albergue in Torres del Río before beginning the final, grueling, 10 km stretch to Viana. She reached the town late in the day and was lucky to find lodging. I spoke to her briefly on the phone – we attempted to do a videoconference using Facetime, but the connection was dodgy, though I did get a few brief glimpses of our beautiful adventurer surrounded by a flock of local children dancing about and shouting at me in garbled Spanish. On this day, after the massive 20-mile hike, Lauren was feeling totally, completely exhausted. She had pushed herself too far that day and knew it. 20 miles a day was not sustainable. She was planning a shorter hike of 11 km (6 miles) on the next day. Lauren said how heartened and moved she was by all of the messages she read in the comments of the prior entry. So thank you all for sending your words of encouragement, your blessings, your prayers, and your love. Lauren receives them and is so grateful. Lauren said she was having a wonderful time and meeting so many kind and outgoing people from many different lands. She did say, however, that she was thinking of taking a train across part of the voyage to shorten the walk. Despite having such a wonderful experience, she misses me and Max and looks forward to returning home. She also wants to have more time to spend enjoying the vistas around her. Viana should have been a beautiful town to explore – Lauren reported that her albergue was right next to the town wall built in the 13th century by Sanche VII el Fuerte. However, I think her late arrival in the day and her complete and total exhaustion precluded any explorations in Viana. She collapsed into a sleeping bag on the narrow pallet and slept an all-consuming sleep. Lauren hiked 11 km (6 miles) today to reach the town of Logroño on the River Ebro. She was still exhausted from the prior day’s massive effort, so she decided to stay here rather than venture further on. She checked into the worst albergue yet. Pilgrims were crammed in 24 to a room, men and women together with barely enough room to move around the door. She was placed on the top bunk again, and was in the unenviable position of having to sleep across from a 1-year old baby. Unfortunately, due to a futbol tournament in town, all other hotels and lodging was booked. She did, however, get out to explore the city a bit. Logroño features few medieval monuments, despite its age, simply because it was such a valuable town and was fought over for centuries between Aragón, Navaraa, and Castilla. Lauren said that she would take a train tomorrow. She wanted to slow down on her pace but also be closer to Santiago. Lauren purchased a train ticket to Astora and raced across the country in modern luxury compared to the ancient mode of pilgrim’s travel. Fields and hills flew past her at what must have seemed an astonishing rate after having traveled at a walking pace for so many days. This reduced her overall walk from 440 miles to a more manageable 236. Having put down roughly 75 miles before reaching Logroño, she knew she had about 160 miles remaining. Restarting from Astorga would allow her to reach Santiago in approximately two weeks traveling at a pace of 11-13 miles each day. Still a great challenge, but it should leave her with enough energy to enjoy her journey (and it will also reduce the risk of injury). 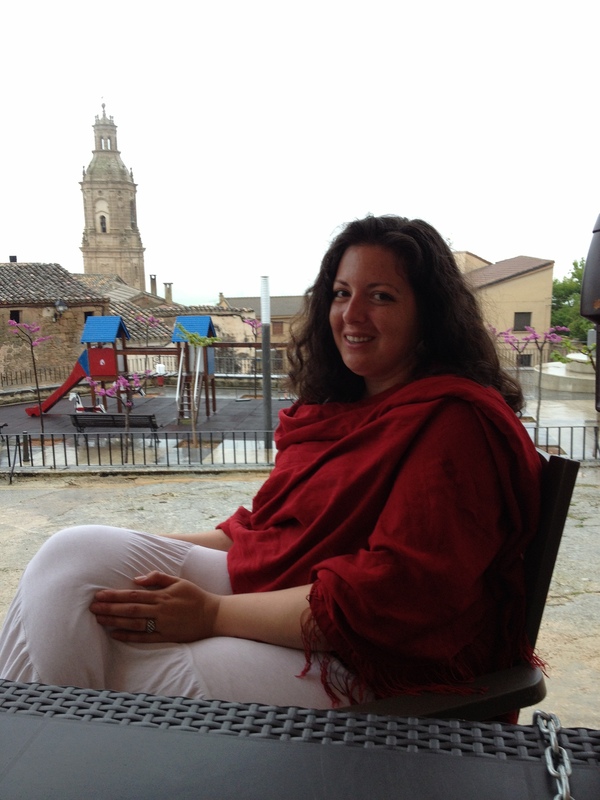 Lauren reported that Astorga was a nice place and that she rested in luxury. This was well deserved following a difficult first week. Astorga, just beyond the city of León, is located on the intersection of two main thoroughfares. In Roman times it was the capital of the ancient Astur tribe and it guarded the mountain roads to the mines. Legend has it that both Santiago and St. Paul preached here after it became an early Christian center. The Visigoths destroyed it in the 5th century, but it prospered again in the 6th and 7th centuries. In the 8th century, it was destroyed again by the Moors. After it’s reconquest by Ordoño I in 850, it became the de facto capital of León. Astorga contains many beautiful features including an 11th century cathedral, the Churche of Santa Marta and San Esteban, and a 17th century Baroque facade on the city hall. The city also still features some of its history with Roman ruins that travelers can visit, including a tunnel between the Calle del Sr. Ovalle and the Plaza San Bartolomé, a Roman plaza and house, Roman baths, and an early Synagogue. Please note that I have updated the Google Map. Lauren and Shannon: I’m loving reading about all of Lauren’s adventures and the detailed descriptions. Thanks for sharing them with us. Lauren, te estas acercando a Galicia. La parte mas bella de toda Espana. Que Dios te bendiga. Acuerdate que cada vez que entras en una iglesia tienes que pedir una oracion que Dios te cumplira. Buena suerte y un fuerte abrazo. Cuidate. I just wanted to let you know that you have inspired me to increase the distance I walk every day. Now I walk back from the porch to put cream in my coffee rather than putting it in when I pour the coffee. That has doubled my daily walk. Thanks to both of you for sharing your progress on this great adventure. We are proud of you and look forward to hearing the details of after you return. Uncle Al.